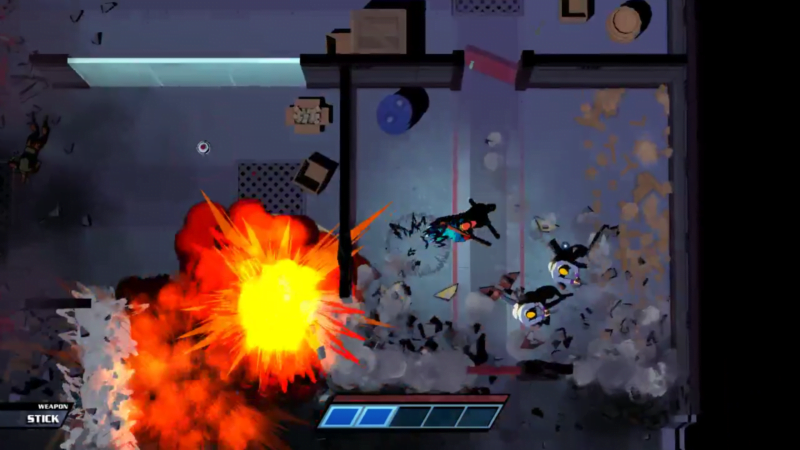 Team Shifty’s premier game scratches the itch to be a bullet-dodging, baddie-beating hero. Ever since 1999, The Matrix has inspired fantasies of bullet-dodging, baddie-beating heroism. Mr. Shifty, the first title from Australian indie studio Team Shifty, seeks to scratch that itch. While successful in delivering a frantically satisfying combat system, the game ironically rests on those laurels and fails to truly capitalize on the potential they had created. The game follows the titular protagonist Mr. Shifty as he attempts to steal a plutonium core housed in a highly secure corporate headquarters. Success revolves around Shifty’s ability to magically warp short distances (shifting, if you will) and punch extremely hard. These are essentially the two mechanics that define the game experience. The result is a quick yet satisfying approach to combat, and that is where the game shines the most. Above all else, the combat is fun. Unsurprisingly, it’s gratifying to send a henchman sailing across the room after shifting past his hail of bullets. Encounters are quick and dirty, often resulting in more than a few shattered windows or cracked marble columns, dented in by rag-dolling enemies. The game succeeds in making you feel powerful, and that serves to really carry the experience. Punching goons out of windows is as satisfying as it looks. But Shifty isn’t an unstoppable killing machine either. A single well-aimed bullet from even the most basic enemy will be enough to do you in. While this doesn’t make the game difficult per se, it acts as a necessary check to your otherwise demigod-like power. However, Shifty’s fragility, while it could have been made into an interesting mechanic to design around, is of frankly little consequence. Dying only resets the player to the start of the room, and enemies will react the same way they did the first time. This makes for an unengaging trial-and-error system at best, a repetitive grind at worst. The game is intensely gratifying when a room is cleared on the first try, but a large part of that magic fades on the second or third attempts. 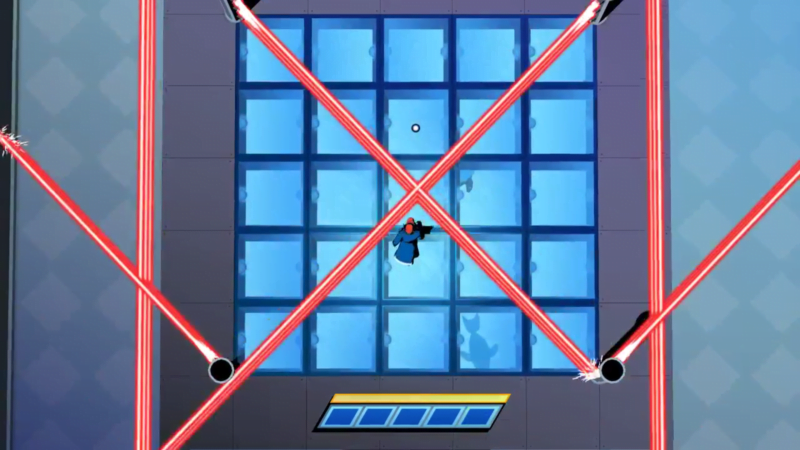 No heist game would be complete without grids of menacing lasers. Beyond just combat, Mr. Shifty boasts a certain amount of charm in its art direction and writing. A comic book-esque aesthetic is maintained throughout the whole experience that, while not necessarily eye-catching, is certainly functional. However, the level design does become quite tired after the first several stages, and players might be tired of seeing the same potted plants and statues by the end of the experience. Music and sound design suffer the same fate, with the soundtrack quickly becoming repetitive after several levels. Small details like the elevator music in between levels were charming, however. Similarly, the writing is entertaining yet forgettable. Mr. Shifty is self-aware in its silliness and doubles down on that with its plot. Without giving anything away, there are essentially only two characters with dialogue, and while neither is amazingly written, both had quips that made me laugh along the way. The plot is straightforward for the most part and essentially acts as a shell for the game to take place in. While that may sound off-putting to some, the plot struck the right balance of being present enough to make sense, without distracting from the gameplay, which is really the main attraction. With the introduction of new enemy types, and a few new mechanics along the way, there is enough gameplay evolution to stay engaging for the whole 3-4 hour campaign. However, the gameplay never really changes from the “shift, punch, repeat” formula, and most encounters can be resolved by simply shifting more. While non-shifting fields create a break in this pattern, these segments don’t prove to be nearly as fun as the open segments. Unique weapons prove successful in breaking up the monotony, but Mr Shifty never really finds its way out of its mold, which is disappointing given the promise. While speed runners will probably find something to love in the dashing and quick-paced combat, most players won’t feel the need to play through the game’s full campaign a second time. The game climaxes in a final, dramatic conclusion that is a fitting way to wrap up the action-movie that is Mr. Shifty. While the game wasn’t perfect, it was pleasantly paced, self-contained, and ultimately an enjoyable way to spend an afternoon. 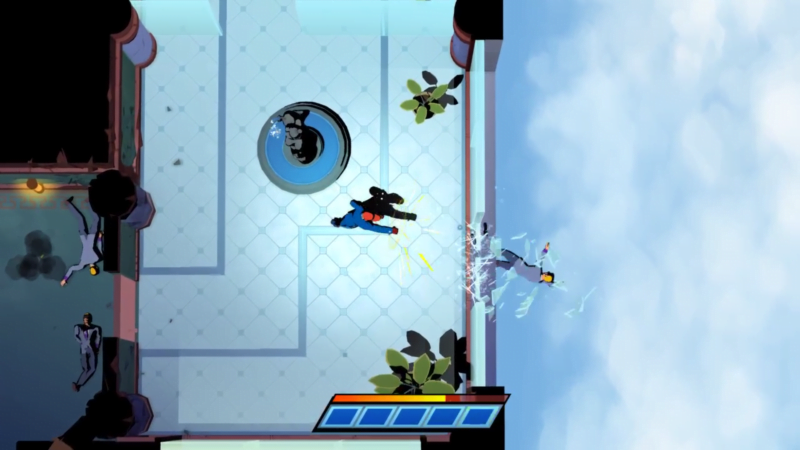 While Mr. Shifty doesn't break many genre barriers, but ultimately provides an enjoyable experience that is worth your time for the combat alone.